Copper Tube Mods - A 3.7v and a V.V. 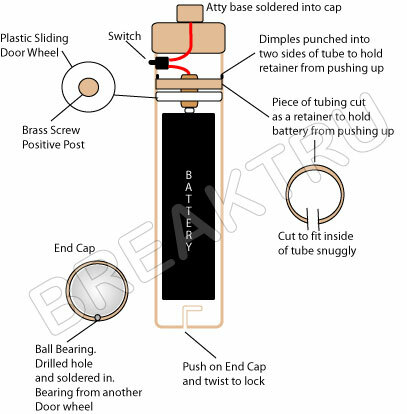 Breaktru Forum | eCigarette Forum | Modding | Topic: Copper Tube Mods - A 3.7v and a V.V. The best material to build a MOD is Copper. Copper is an excellent conductor of electricity. Technically it is better than thin walled tin, alloy, cast or aluminum which are not great conductors. A "NO SOLDER" PV can lead to poor connections and amperage loss if not properly aligned to the adjoining parts. I have experienced this with a mod I bought. I have just built a thick walled copper tube mod. More like copper pipe. I soldered the atty base to the copper cap and the atty positive directly to the switch. The switch is a 3amp switch. The other end of the switch is soldered to the positive copper head screw, filed flat to fit flush against the head of the battery post with the entire diameter of the screw covering the entire battery post. All wire used is 20 gauged for less loss. I opted not to use thin 24-26 gauge telephone wire. The negative spring is a thick diameter gauged chrome plated steel. I would have used copper but the copper springs that I have seen are thin diameter and loose there spring tension. I'm sure there are good copper ones but I could not find any. UP DATE: Installed a Copper Hot Spring made for the Silver Bullet. My view on the plunger is that the contact point would have to fit squarely flush for best contact. If there is any side to side play/movement full contact may not be achieved. So I went with the 3 amp switch instead. I'm jealous. I want one badly. I would love to see pictures of a copper mod. I really love the way this copper came out. I will post pictures as soon as I get the switch. I'm also working on a unique method for a locking mechanism for the battery end cap. Rather than the screw or o-ring method. It's a simple method but with hand tools it's not that easy. If only I had technical machinery. I have an idea in my head. Now to get it work in the real world. Me too breaktru. I want one. I'd like to make a 6v with a regulator but I lack the skills. Oh well, I'll keep dreaming. The Ball Bearing worked very well but after much use, it fell out. It didn't solder well probably S.S. A copper BB would be good but they are too large. I put in a tiny machine screw in it's place. The protruding stud serves the same purpose as the ball bearing, allowing it to twist on and twist off. Two on each end of the cap would be better but precise cutting of the grooves is imperative. Hard to do with simple hand tools. Ball bearing: I drilled a hole not all the way thru from the inside of the cap, half the diameter of the ball bearing, heated up the cap w/ torch, put a tiny drop of solder, put in ball bearing, heated again so bearing would stick to cap. To See Attached Photos, Log on as a Member.. I drilled and tapped with a 1/4" x 40 tap size. The lock nut is on the inside. Notice that I cut down the cap lengths to half their original size. I've been using this thing for almost a week now and I got to say it's fantastic. It has not leaked one bit. I've use several attys that have leaked on my other two PV's and have not leaked in the copper. Is it a better atty base. The base was bought from Madvapes. Now that I've got this 3.7 volt tube mod figured out, I build another Copper Tube little longer to fit a switching regulator with a variable control. I had bought 2 feet of copper pipe and only used 4" for the mod above. I am using (2) 3.7 volt 18350's, 1200mah, protected batteries which are 38mm long each. The regulator that I got as a free sample from TI is: http://focus.ti.com/lit/ds/symlink/ptr08100w.pdf is up to 96% efficient with little heat. Although my end caps work good, I cut them down even smaller. I spend today cutting and fitting the parts and wired up the regulator. Tested the circuitry outside the tube and I can vary the voltage (no load) from 3.6v to 6.1v (fully charged). I am in the process of putting it all together. Also waiting on a couple of HV atomizers that I ordered. Don't want to pop my standards. Search thru my pile of old computer parts and found several push-buttons. I found an exact replacement for the broken CK switch at 3 amps at 12 volts. Okay Mod completed and I am set at 4.23volts with a 2.8 ohm atty I found. I got to say, it's a bit long at 6" but would make a nice self defense weapon. The Varible Voltage Copper Mod is on the far right with (2) 3.7v 18350's, 1200mah. I'm really like it at 5.0 volts. Tornado w/900mah and 2 650mah batteries with eGo type B Mega atty/cart. Indulgence V2 w/3.7v 18650, 2400mah battery and 510, 810, 901, 401 atty tops. Copper mod w/ 3.7v 18650, 2400mah battery and Joye 306LR atty. Copper mod Variable Voltage w/ (2) 3.7v 18350's, 1200mah batteries and a Joye 2.8 ohm atty. I'm going to build one. I think I'll start with the 3.7v mod as my electrical skills are limit. Thanks Breaktru, your diagram and photos are a good guide. I think I'll will buy the CK switch and battery connectors from Madvapes. Too bad they don't have springs. It would be nice to get all the parts from one vendor. I like the way the cut down caps came out. The shorter one is on the VV mod. I definitely like the look of the cut down caps. Gives it a better look. Thanks for your diagram. You made this so simple. I'm building mine as soon as I get my parts. And it's so cheap to make and best of all, I'll be making it myself. You made this thread so easy to follow, I am going try my hand at making this mod. Then I'm going on to your V.V. Copper Mod. I just finished my Copper PV Mod using your above information and I am so proud of myself for building this great PV. It only cost me a few bucks for parts and materials. I want to thank you so much breaktru for making this available to us on your web site. I visited your main breaktru.com site and looked over some of your programs. I will be registering your Payroll software, great program. I have a small business with 5 employees and this will come in handy calculating their withholding tax for their paychecks. Also, I've been using your eJuice calculator for a month now and it is a wonderful tool. I used the others out there and NONE compare to yours. Thanks again my friend. I will recommend your site to all my friends and everyone I associate with. First, I would like to thank you for such an inspiring and simple Mod. Personally, I have always loved the look and feel of a well worn copper tool. As an analog smoker I was rarely seen without my copper Zippo and this mod will make a wonderful and healthier replacement for that trusty friend. I am about 75% complete and awaiting parts from Madvapes so that I can finish. However, since I am relatively new to the art I overlooked the limitations of the switch that I ordered and I am in need of an expert's opinion of how to rectify the problem. Here is the switch that is already on the way, http://www.madvapes.com/Tactile-Switch-with-Round-actuator-300g_p_2208.html and in reading the specifications tonight I realized that it has an input limitation of 50 ma and without a solution I will burn it out running an 18650 without some sort of transistor. Initially I was going to order the LDO 5 volt, 3.0 amp regulator with control pin to solve the problem, however they are out of stock and do not know when they will get more. I was considering a trip to Radio Shack to pick up a simple transistor, however, since I am completely out of my element here I was hoping you might be able to suggest the correct one (Maybe http://www.radioshack.com/product/index.jsp?productId=2062618 ) and possibly some sort of diagram. I suspect that I will need a resistor in line with the switch to reduce the 1.5 amp down to .5 amp for the switch, is that correct? Any help or suggestions would be greatly appreciated and Thank You again for all the information you have openly provided. First, I would like to thank you for such an inspiring and simple Mod. Personally, I have always loved the look and feel of a well and I am in need of an expert's opinion of how to rectify the problem. Thank you. It's a pleasure to help. Right now I'm @ jury duty. The easiest & space saving solution is to use a 3 amp PB sw. If u r bent on using a MOSFET 2 utilize the tactile sw, I can help u out when I get home. I hope you have a good day and look forward to future correspondence. And Thank You again for all the hard work you put into this. Are you making a standard copper mod with just a single battery, P.B. switch and atty? I want to make sure you are not adding any regulators as this would be a different wiring scheme. It is almost identical to your OP with the exception of the type of switch and some minor aesthetic changes. For wiring purposes it is identical at this point. You can use the tact sw or make it a touch sensor. Thanks for the link. I had come across it during the day today, but was not sure if it would apply to my setup. I appreciate you verifying this for me. One question regarding one of the posts that seems to fit my situation the best. With a switch it's even simpler. And you only need one resister and the value is not that critical. In Raidy's diagram just delete the first 1K resistor and just wire direct to 'G' (GND) on the mosfet. Nuck uses a 10k on his 5V Fistpack, bigblue is showing a 47k. Just use one of the mosfets that need 2.5V or lower to fire. And note you are switching the negative. If you are using it in a pipe or flashlight mod just flip the battery around (making it a positive ground). This is on the second page posted by WillyB. If I am reading this right I would need to insert the battery in backwards for this to operate, is that correct? Thanks again for all of the help and I will see if I can get some pictures up to show my progress. Notice that the resistance values differ from Gate to Source on the Mosfets that the users have chosen. Due to the different characteristics of the Mosfets. Check the Mosfet numbers before ordering resistors. Don't assume that the same G to S resistor will work on all Mosfets. If you look at the Mosfet P-Channel that I used in my "Side x Side" Mod, you will see a different value. I have a large selection of resistors and physically tried different values to get it to work. Yes if you use a switch, you don't need the 1k. Yes in WillyB's the battery was reversed. Well, as it turns out, I have decided to postpone the utilization of the tactile switch until I have had a chance to educate myself on the electrical properties of the Mosfets and quite possibly until I start to build my first VV device. I do thank you for all the information and resources, not to mention the instructional post on the Copper Mod. I have completed the shell components and the majority of the wiring with a regular 3 amp switch. The only missing components are the battery and the battery connection, both are on order and I hope to have them by the end of the week. I will try and post a picture once its complete, an thanks again for all the help. I am not opposed to using a 3a switch, I would just prefer to use the tactile. I have read posts on ECF and they say that the tactile switch is milliamp rated. Aren't you running like around 2 amps thru it? Wouldn't it burn out? I would listen to the Pro. Mr. Breaktru. He's seems to be knowledgeable about this. I may not have the post numbers, but I do a lot of forum stalking. Yes elza, that tactile is a nice switch for LOW amperage (50ma) and not suited for 2 amps. I used it for my Digital Pot because it is a LOW current circuit. Re: Copper Tube Mods - A 3.7v and a V.V. I found this copper mod link on another forum. It sure is popular. Now I see why. With all this info here I can see why. Looks easy and reliable solid mod. I use #0000 grade steel wool about once a week. Takes about 5 seconds to make it shiny bright again. Warning, leave the atty on so not to get any tiny metal hairs into the battery to atty connector. Don't wan't to cause a short. There so dam small and you may not notice it. Also, be careful if you're buffing w/ S.W. with the tubes off. That stuff can get inside the circuitry and short out the internals. Haven't tried the Scotch pads. They may work but I'm sure it would be more effort to shine to a bright finish. Update: Scotch pads work fine. Comes in several grades. Don't use too coarse of a grade of steel wool or scotch pads. You don't want to make scratches in your copper. Takes a lot of effort to remove them. It would be really cool if you mentioned the diameter of the tubes, endcaps, and approximate lengths for a single 18650 battery and all the pieces laid out. etc. I went to home depot and they didn't have those end caps can you believe it? Another thing I noticed was that the costs were around $30+ for the materials so I decided to wait to post here to make sure that sounds about right before I bought anything or paid too much. Thank so much for the great instructions!! Can't wait to figure it all out and find all the pieces to try it. and I can get caps cheaper if you look around. Also found cheaper plated springs and cheaper batteries. I could get the price down to $10 with the cheaper parts for a 5 or 6 inch copper tube mod. A lot of us started out w/ those little ecig thingy including me. Mine was a from eSmoke which helped me totally quite smoking in 3 days. Plus it had a 30 day money back refund which I made good on, on the 29th day. I'm sure the guys at the fire station will love a copper mod. It's a manly mod for sure. I have made a few coppers myself and you can check the links below. I love them! Thanks Mr. Breaktru! Very nice assortments of copper mods fsors. Thank you Mr Breaktru! You are the original! Thanks again to Mr. Breaktru, I don't think I would have attempted this mod. if it had not been for your pix. and instructions. First. buy extra pipe and caps, your gonna screw a few up. even with a drill press there were a few caps destroyed in the process. extra parts, order a few, well the switches I bought were very large, they didn't look that big on the web site. oh well, I made due. my 510 connection, yea I ruined one of those as well. I wish I would have taken more pix, but this project took longer than I thought. for the positive terminal of the battery I used a center section of a large suction cup cut down to fit snuggly, with a screw in the center for the terminal and then I expoxyed it in the tube once I got it placed in the proper location. with the 18650 battery., All in all, it vapes like a choo choo train, and I love it. I got more switches on the way and plans to build more. I will take step by step pix next time. right now, I need to vape. thanks to everyone who has posted their mod. If you were using Quick Reply, click the "Preview" button for more options. I replied using the reply buttom and when I click on insert image it just puts the words img in my post. I know I'm doing something wrong. I just cant seem to figure it out. tried using the help button and search button for answers, but nothing, tried cut and paste. For an image link you would have to enter a location to the image such as a web address. To attach an image from your PC, look below the text box, the left bottom corner has a "+ Additional Options.."
Thanks H.F. Glad pix and instructs helped out. No need for the Mr. title. Always good to have extra parts on hand. I always over buy just in case. Good work H.F. Looks good. Button is big but not bad looking. The guys at the fire station will like the Red button. It's how it works that matters. Very nicely done hatefire. You put a nice shine on it. I love coppers they are the coolest thing. Everyone should have at least one on hand. Thanks, for the comments, and the assistance from all the other modders. after I polished the copper I put a coat of clear on it to maintain the shine. currently running a brc 18650 3600mAh 3.7 li-ion protected battery in it. will give an update on battery life at a later time. also running the Bauway 510 XL CE2 clear cartomizer 2.9 ohm filled with spring vapor (irish cream) pg/vg 50/50 blend. emptied one cart on second fill up, so far so good. Nice work! Looks good! Love them coppers!